Look America, no bling. No rings, no earrings, no tats, no bracelets or watches, at least that I can see. Just Rand Paul, one of the smartest guys in politics. He’s not our lord and savior, nor is he America’s daddy, but Rand Paul impresses me more and more each day. Talk about putting your money where your mouth is! 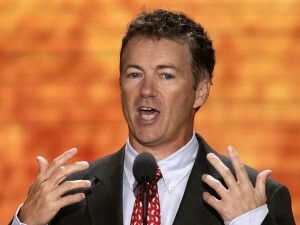 Rand Paul is DO, where most politicians are TALK. Obama could take a lesson from this man, and so could most other politicians. Sen. Rand Paul is taking his own message of fiscal conservatism to heart, returning about 17 percent of his Senate office budget to the U.S. Treasury. Paul, who is set to return $600,000 from his $3.5 million office budget, has returned six-figure sums before. The libertarian-leaning lawmaker said his office scrutinizes spending from big-ticket items like travel, down to “computers, paper, ink cartridges. Everything we buy,” the report said. While Obama spends MORE and pulls a bait and switch with false budget cuts, Rand Paul GIVES TAXPAYERS BACK 17% of OUR money. Here here, Rand Paul. The Tea Party movement applauds your efforts.